Today was such an hectic day.. But i am happy that my day was good I am satisfied that i was able to do most of the stuff i had decided to. As its summer time,there is so much possibility of food getting spoil. That is what happened last week most of the time the milk would break & we happen to collect lot of paneer. We have never prepared paneer at home nor had we cooked it any time. But it was my longtime desire to cook it ,just that i was too lazy to do it. Finally i cooked it today. 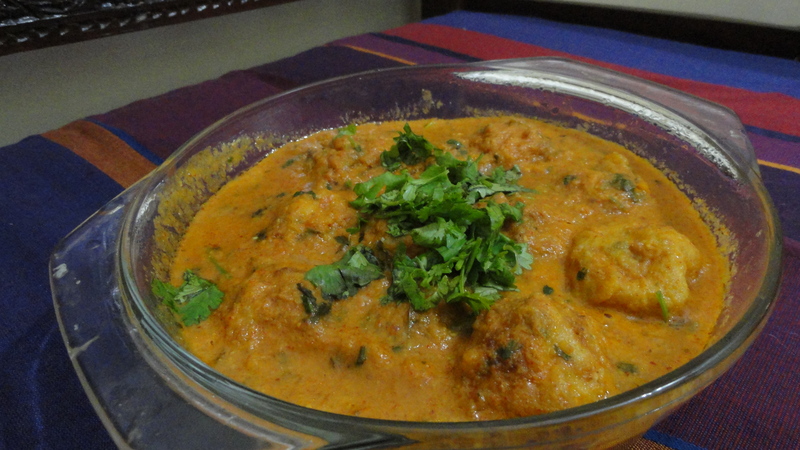 Yes i cooked Malai Kofta today,it was delicious,I never expected it to be so good.I was happy everyone liked it. doesn’t it look tempting ? 1.mix the boiled & mashed tomatoes with the shreded paneer. 2.Add Hara dhaniya ,green chillies & salt to the above mixture. 3.Now make small balls from the above mixture. 5.mix a teaspoon of all purpose flour with some water. 6.Now dip each ball in the flour & deep fry them. 1.Grind Onions & green chillies to paste. 3.Then add the onion & chilli paste , let it fry for few minutes. 4.then add ur spices-Red chilli ,dhaniya & haldi powder. 5.Grind the tomotoes & add it to the pan. 6.add salt & let it cook for about 15 minutes until the oil stands. 7.Then add some Khoa to give the richness to the dish & let it cook for 5 minutes. 8.Then add fresh cream & let it cook for few more minutes. 9.Then add garam masala & hara dhaniya.